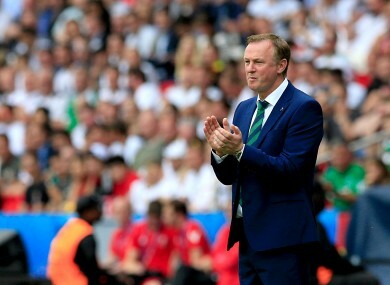 THINGS JUST KEEP getting better for Michael O’Neill’s Northern Ireland. They mightn’t have got the result they wanted against world champions Germany this evening — a 1-0 defeat — but tonight’s results in Group D have guaranteed our northern neighbours’ progression into the last-16 of the European Championship. Before Turkey and Czech Republic kicked off at 8pm in Lens, Northern Ireland knew that a draw, or a win for Turkey by less than three goals, would clinch their spot in the next stage. And they got exactly that as a Burak Yilmaz goal on 10 minutes, Turkey’s first of the tournament, and a screamer from Ozan Tufan on 67 minutes, inspired Fatih Terim’s side to a surprise victory, which means that Northern Ireland will play France or Wales in the next round. Their progression brings goalkeeper Michael McGovern’s heroics against the Germans further into the limelight; he produced a string of quality saves to repeatedly deny Joachim Loew’s side in the Parc des Princes. As four of the six best third-placed teams advanced to the next stage, Northern Ireland’s three-point total looked vulnerable and they were relying on other results to go their way. But with third-placed Albania also finishing on three points in Group A and with an inferior goal difference to O’Neill’s charges, and Turkey also behind on the same differential, the only thing left to do for Northern Ireland fans is celebrate a momentous achievement. Northern Ireland, under the guidance of former Shamrock Rovers boss O’Neill, stunned everyone when they topped their qualifying group, securing qualification for their first major tournament since the 1986 World Cup, and their first ever European Championship. They were then drawn in one of the tournament’s toughest groups, alongside world champions Germany, Poland (the top scorers in qualifying), and Ukraine. But 1-0 defeats to Germany and Poland bookended a famous 2-0 win against Ukraine and that has proven good enough for them to advance to the knockout stages. Email “Sweet 16: Northern Ireland have qualified for the knockout stages of Euro 2016”. Feedback on “Sweet 16: Northern Ireland have qualified for the knockout stages of Euro 2016”.